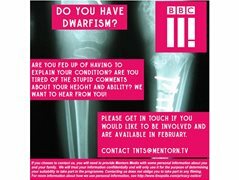 BBC3 are looking for amazing people living with dwarfism for BBC3's Things Not To Say. We want to challenge the misconceptions they face. We are filming in London. 1 Female Singer needed to Join Girl Group!